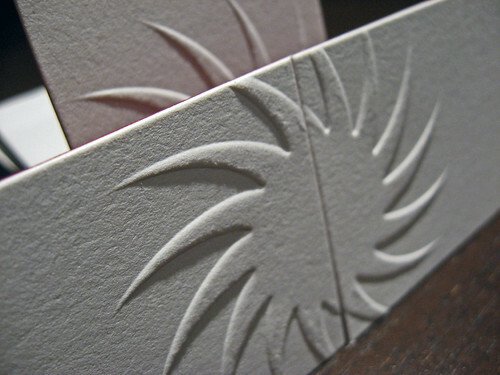 Embossing raises the design on the paper. Don’t worry we didn’t put these cards in the press backwards. The swirled sunburst design is supposed to be raised because it was embossed, not letterpress printed. 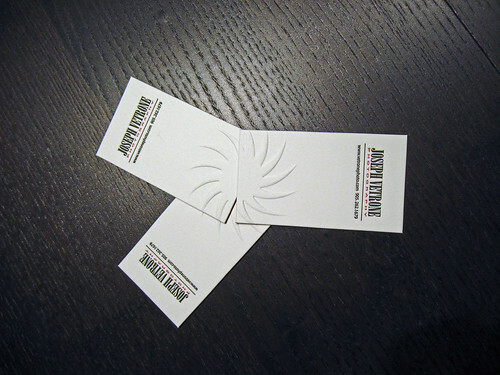 We printed these business cards for Joseph Vetrone, a photographer located in Niagra Falls, Ontario. Dave at Dave Bush Media Design, who is also located in Ontario, designed the cards for Joseph. The front of the cards were letterpress printed in black and red and then blind embossed on Crane’s Lettra 110lb cotton stock. To cover the emboss on the back of the card, we duplexed a sheet of red text weight paper to the back. The cards were die cut to a final size of 3.5″ x 2″ tall to ensure the embossed design wasn’t flattened by the pressure clamp on the paper cutter. Embossing is similar to letterpress as they both require a plate to print the design. However an embossing plate is the negative of a letterpress plate or more simply put the design is recessed into the plate for embossing while it is raised on a letterpress plate. The last key to embossing is the counter which is the male (or positive) counterpart to the die that raises the paper into the plate. Embossing can be done also be as a registered emboss, where we print on the paper (using letterpress or offset) and the register the emboss design to the printing on the paper.